There’s an art to fishing, and millions of people take up this challenge each day. Whether you enjoy fishing on the lake, out in the river or on a boat, every fish species presents its own fight against your rod. The fishing line that you choose is especially important during these adventures. Picking the wrong line can result in no catches during the entire day. Fish might see the material, or it snaps under their weight. Be successful with each trip by trying out fluorocarbon fishing line. This specialized material has all of the features necessary to bring in that large haul by day’s end. The top pick among all of the fluorocarbon products today is the Berkley design. They refer to this model as “Vanish” because of its camouflage under the water. It’s advertised as 100-percent fluorocarbon, and that’s the type of material that will give you the most reliable casting on the water. Before you look at other line designs and price points, it’s a good idea to research this particular product. It might be the hidden tool that you need to catch an elusive species. The first feature that you’ll notice is the line’s appearance. When you spool it off of the reel, it’s barely visible in broad daylight. Cast it into the water, and you’ll wonder if it’s still attached to your rod. Many fish species have sharp eyesight, which makes them difficult to catch with standard lines. 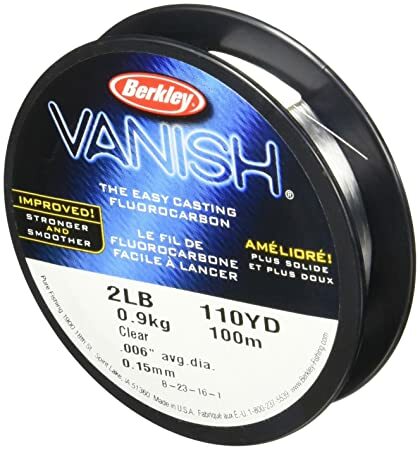 Because they won’t see the Vanish product, they’ll be more vulnerable to bait and lures. This feature is the main draw for most consumers because a visible line can make an entire day of fishing a failure. A feature that’s not often seen on regular fishing products is abrasion resistance. If this line rubs against a rock, boat side or other area, it can retain its shape and strength. Although it’s possible to eventually wear down this fluorocarbon, the material will hold up under a lot of strain. In fact, you can perform a field test by pitting this material against everyday fishing line. The Vanish product will probably win out every time. One of the reasons why this material doesn’t break down so easily is because it’s water resistant. Fluorocarbon is a specialized polymer, which doesn’t have the pores that other products inherently contain. As a result, water can’t infiltrate the plastic and weaken it. When you spend all day out on the water, fishing line that’s nearly impervious to moisture is a major bonus. The most common spool size in the industry is 110 yards. This length is ample enough for most fishing trips, but there’s another detail that you must consider. Each spool comes with a different break strength. It ranges from two to 14 pounds. Examine your future fishing trip and the fish that are common in that location. Pick a break strength that will hold those species until you can grab them with your bare hands. One concern voiced by many consumers is the knotting frustration. Consumers either cannot see the knots that they’ve made or they become loose upon entering the water. It’s difficult to determine if this issue is user error or a product problem. Try to use nautical knots that are meant for fishing lines and choppy seas. There are other consumers that applaud the knotting ease and reliability so there are conflicting reports. Experienced fishermen understand that a floating line will often alert potential prey of a lure. Vanish line is different because it actually has some weight. It will sink along with the lure or baited hook. The sinking action allows the line to remain plumb with your rod tip. As a result, it’s easier to locate your hook in a busy fishing area. Most lines allow the hook to wander far from the rod tip, which creates tangled lines and lost bait. There are mixed reviews on this product, but many people do comment that the material feels good when spooled onto their rod. In fact, the line releases from the reel with ease so that a fish isn’t missed. Examine each benefit and drawback to this line, and you might be sold on its best features. With Berkley’s well-known name backing up the materials, you know you have a winning line for the long term. 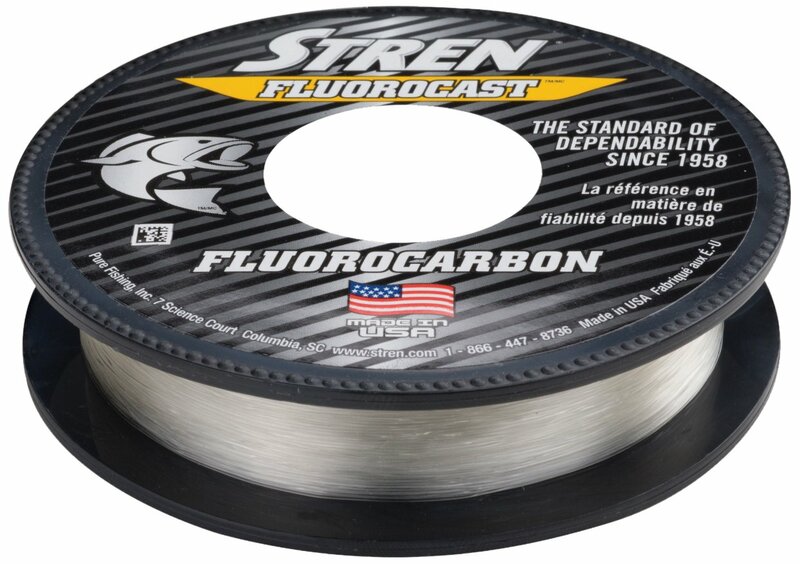 If you’re looking for a less expensive fluorocarbon product, give the Fluorocast line by Stren a try. It comes in a silver-and-black box with either 100- or 200-yard lengths. The manufacturer emphasizes that this product isn’t a coated version of fluorocarbon, but it’s entirely made of the specialized polymer throughout its design. Try out this line on your next adventure, and you won’t want to leave home without it. Depending on the fish species, they can grab onto your hook and line with amazing strength. Some lines simply snap as a reaction to these violent attacks. The Stren line is different, however. The strong plastic can take on almost any strike and survive the shock. Vibrations simply transmit through the line as they slowly fade away. As a result of this strength, you won’t lose the line or your hooksets. For avid fishermen, this is a feature that’s highly regarded. The manufacturer and consumers report that this product feels like nylon, but it has the strength of fluorocarbon. Other plastic lines are very stiff, which makes them difficult to reel in or cast out. The only way to truly make a determination on this line behavior is by trying the item in the field. Feel the line moving into the water and catching that big fish. You’ll know how good the line is at that point. Although you want flexibility in your line, there’s also a particular sensation that you want to feel. An accurate feeling of a fish on the line is how fishermen know when to pull on the rod. The Fluorocast line allows the fish’s vibrations to move through the plastic. As a result, you’ll feel tiny nibbles on the line. Give the rod a good jerk, and you’ll have dinner ready for the ice chest in a few minutes. Consumers report that the line does have a low-spool memory. This statement merely means that the product won’t cast in looped sections and remain in that shape. Spool memory also contributes to tangled lines that only make fishing a frustrating sport. The high-quality Fluorocast will simply reflect its weight and strength with straight lines and perfect casts out to the depths. A drawback noted by some users was the line’s uneven construction. Consumers looking at the line have noticed that it has a twisted appearance. As you cast it outward, it may twist even further. This observation hasn’t become a major problem, but you should be aware of its presence otherwise. Over time, the line might break down because of this manufacturing oversight. An unusual application for Fluorocast is ice fishing. In most cases, ice fishing involves an enclosed structure with a break in the ice. Slip your hook and line into the water, and you’ll know where the bait or lure is at all times. The currents aren’t very strong under the ice so the line will remain straight and invisible to prey. Fish that are attracted to the light at the ice break will encounter your line as you pull in the biggest species possible. Stren has been in business since 1958, so they know what works and doesn’t work with their products. In fact, they won’t release an item unless it’s entirely tested and approved by their experts. If you’re used to mono or nylon lines, it’s time to try this product out. You might be surprised at the quality difference in your fishing success. 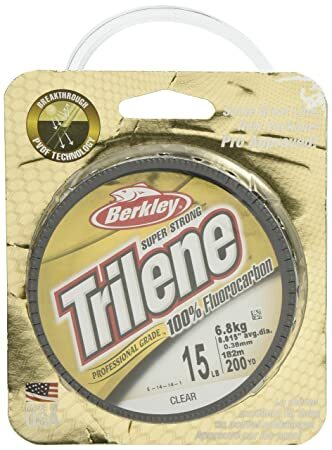 Get excited about that next trip out on the water by tossing a Trilene spool into your fishing-gear box. This product comes from Berkley, which is one of the leading manufacturers in the line business. Enjoy the strength that’s inherent in fluorocarbon line, but with a lower cost than others on the market. In fact, most consumers appreciate the reliability of this particular fluorocarbon line without the high price that normally comes with this material. Explore your options with the Trilene brand, and you’ll be catching that favorite fish in no time. This fluorocarbon line is made out of a secret formula based on the concept of high-impact strength. With a 100-percent fluorocarbon material throughout the line, fish can grab, pull and tear at the hook without any loss of your fishing gear. Many consumers are amazed at the strength that this line offers when the fish are extremely agitated. Broken lines and lost hooksets won’t be an issue on your next trip. Select from either clear or green line with the Trilene brand. In reality, most fluorocarbon products are exclusively clear because this color offers the best camouflage within the water. However, you might have a more volatile atmosphere under the water’s surface. Fishing in rivers and some lakebeds can be challenging because of the murky waters. A green line might be a solution for you as it blends into those darker waters. Simply match the fishing trip to the line, and you’ll have a winning catch. Be aware that experienced reviewers are slightly concerned about the durability issue posed by the Trilene product. They mention that the line has some strength problems as it becomes wet. Berkley counters that observation with the advertised “higher strength per diameter” statement. This manufacturer is known for its quality products so it’s your choice to give this material a chance. It may work well for your needs compared to the reviewers’ tough conditions. Every line will have some limitations to its strength. Most fishermen will pick out several 200-yard spools for their next trip. If you decide that you like the Trilene product, it’s a smart idea to buy it in bulk. Reviewers state that you can find this line sold in 2,000-yard spools. Purchasing the material in bulk simply means that you pay a lower price per yard. At the end of your fishing trip, you’ll have plenty of line to spare for the next adventure. See your line cast into the water while leaving it invisible for your chosen fish species. Berkley designed this line with reflective properties that work for the fisherman only. You’ll see where the line enters the water, but sunlight rays pierce the fluorocarbon otherwise as fish see nothing at all. You’re left with the perfect tool to catch the big one. Try the Trilene product out today as you compare it to previous lines. It offers high-quality materials without breaking the bank. For less than $10, you can have a 100-percent fluorocarbon line that will perform well under pressure. 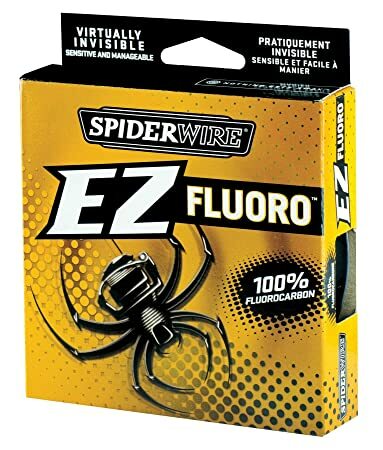 The EZ Fluoro by SpiderWire has an easy-to-spot retail box as you explore all of the lines in your local store. A large spider on the box tells you that this line will be as strong as those classic webs. Although this product has some reported drawbacks, it generally performs well for the average fisherman. Take a closer look at the EZ line before settling on a purchase. You’ll be able to make quick knots out of this material. It’s advertised with ample manageability as you loop, knot and secure your hooksets to the line. Some consumers have stated that they lose their hooks with this brand, however. Follow all of the directions that come with the SpiderWire, and you shouldn’t have any major problems. You might notice that this line doesn’t have a lot of flexibility. The line’s low-stretch feature means that you’ll feel the product in your hands as the fish grabs onto the hook. You want the line to transmit those vibrations in order to catch each fish that comes along. This feature is attractive to nearly every fisherman. This line comes in a clear hue, but you shouldn’t have any problems seeing the cast. Users applaud the line for its visibility above the water line. If you could experience the line from the fish’s perspective, you’d be amazed at the invisibility properties. It will trick almost every species into grabbing the bait or lure. Choose between 2- to 15-pound break strengths when you want to try the SpiderWire brand. Although this line doesn’t offer any tougher features, most fishermen find these strengths to be sufficient for most trips. When you’re simply looking for those basic catches, a 4-pound line specification can work for your needs. Consumers report that this line works well on many different reels, including lightweight types. As a budget product, try it out on your next fishing trip. Use this line, and then switch to your normal brand. You might be surprised at the difference that this line makes in your fishing success. In the end, it’s the product’s quality that makes your fishing a good time out on the water. Many manufacturers have seen the excitement over fluorocarbon materials, and they want their products to have some of that same buzz. In some cases, fluorocarbon is being coated across everyday fishing line among newer products. Although this production choice isn’t necessarily a bad strategy, it can be detrimental to your fishing success. Coated line won’t have the same strength as 100-percent fluorocarbon products. You might have a snapped or stretched line to contend with during each adventure. Ideally, pick a product that’s advertised with 100-percent fluorocarbon components. You’ll notice a huge difference as you reel in the big one. Fluorocarbon products aren’t that different from other lines when you compare spool costs. Admittedly, fluorocarbon will always be more expensive when it’s a pure product. It’s simply more expensive for the materials. You’ll also pay more per spool when you request a longer and thicker line. You may be able to save some money on each spool by purchasing them in bulk quantities, however. The discount may only be a few cents, but the line can be stored in a cool and dry place for many years. When you fish consistently for bass each year, you can stock up on line that will save you money over time. Fishing line comes with many details listed on the spool’s exterior. As an amateur, you may only want to know about the product’s length. Consider some of the other details, such as break strength, before pulling that item off of the shelf. Each line has a specific weight that it can handle. If you try to haul in a 10-pound fish with a 2-pound break-strength product, you’ll lose the trophy in a split second. Professionals suggest that you match the line’s break strength to the chosen fish species. Ideally, the break strength in pounds should be higher than the fish’s weight. Fluorocarbon isn’t known for its flexibility. In fact, it’s a material that’s derived from plastic where flexibility is limited. As you compare different lines, consider their stretch factor. Some manufacturers put a lot of research into their items so that flexibility is possible. Ideally, you want a product that has some stretch but not too much. A stiff line allows you to feel for the fish as it struggles on the hook. Too much flexibility will only leave you blind in the water. You also need to match the flexibility needs to the fish species you’re trying to catch. Some fish will move around more on the hook than others. In the end, selecting the best fluorocarbon product for your fishing trip is a choice that’s based on several details. You may need a solid, casting action or flexibility in rough seas. Alternatively, fishing off a pier might be your chosen activity. Regardless of your plans, try to match your trip to the available products. Fishing line cannot serve every situation with the best features. It’s up to you to identify the most important features and apply them as necessary. From catch-and-release fun to fishing for dinner, the right line will help you conquer the open water.